Bernard-Soulier syndrome (BSS) is one of a group of hereditary platelet disorders characterized by thrombocytopenia, giant platelets, and qualitative platelet defects resulting in bleeding tendency. See the image below. 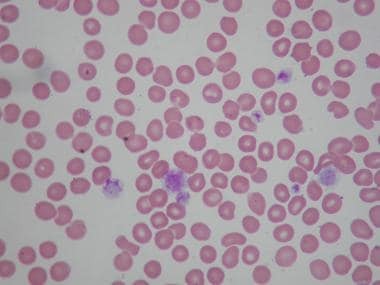 Peripheral smear of patient with Bernard-Soulier syndrome (BSS) showing giant platelets. These platelets are not counted as platelets in most particle counters. Bernard-Soulier syndrome (BSS) was first described in 1948 as a congenital bleeding disorder characterized by thrombocytopenia and large platelets. The disorder was recognized to be familial and inherited in an autosomal recessive manner. In the 1970s, the molecular defect was shown to involve the absence of a platelet membrane glycoprotein (GPIb/IX/V) complex which is the receptor for von Willebrand factor (vWF). BSS is one of a group of hereditary platelet disorders characterized by macrothrombocytopenia and a tendency toward bleeding. It is the second most common inherited platelet defect. Other disorders in the category of macrothrombocytopenia are the May-Hegglin anomaly and gray platelet syndrome. Treatment is generally supportive. Patients should be educated about the disease and the need to avoid trauma and nonsteroidal anti-inflammatory drugs (NSAIDS). Emphasis should be placed on good dental hygiene. The underlying biochemical defect in BSS is the absence or decreased expression of the GPIb/IX/V complex on the surface of the platelets. [2, 3, 4, 5] This complex is the receptor for von Willebrand factor (vWF), and the result of decreased expression is deficient binding of vWF to the platelet membrane at sites of vascular injury, resulting in defective platelet adhesion. GPIb/IX/V complex is located in the platelet cytoskeleton and hence is also essential to the production of platelets from the megakaryocytes in the bone marrow (which explains the large size and decreased numbers of platelets in this syndrome). BSS is rare, with an estimated occurrence of less than 1 case per million population. Bleeding due to BSS may begin in infancy and may continue with varying severity throughout life, although it may somewhat diminish with age. Males and females are affected with equal frequency. To date, BSS has been described primarily in whites of European ancestry, as well as in the Japanese population; its prevalence in other ethnic groups is unknown. Diz-Kucukkaya R. Inherited platelet disorders including Glanzmann thrombasthenia and Bernard-Soulier syndrome. Hematology Am Soc Hematol Educ Program. 2013. 2013:268-75. [Medline]. [Full Text]. Young G, Luban N, White JG. Giant platelet disorders in African-American children misdiagnosed as idiopathic thrombocytopenic purpura. J Pediatr Hematol Oncol. 1999 May-Jun. 21(3):231-6. [Medline]. Mahfouz RA, Bolz HJ, Otrock ZK, Bergmann C, Muwakkit S. Novel mutation in the glycoprotein Ibß in a patient with Bernard-Soulier syndrome: possibility of distant parental consanguinity. Blood Coagul Fibrinolysis. 2012 Feb 15. [Medline]. Bartsch I, Sandrock K, Lanza F, Nurden P, Hainmann I, Pavlova A, et al. Deletion of human GP1BB and SEPT5 is associated with Bernard-Soulier syndrome, platelet secretion defect, polymicrogyria, and developmental delay. Thromb Haemost. 2011 Sep. 106(3):475-83. [Medline]. Savoia A, Pastore A, De Rocco D, Civaschi E, Di Stazio M, Bottega R, et al. Clinical and genetic aspects of Bernard-Soulier syndrome: searching for genotype/phenotype correlations. Haematologica. 2011 Mar. 96(3):417-23. [Medline]. [Full Text]. Feng S, Christodoulides N, Kroll MH. The glycoprotein Ib/IX complex regulates cell proliferation. Blood. 1999 Jun 15. 93 (12):4256-63. [Medline]. Bragadottir G, Birgisdottir ER, Gudmundsdottir BR, et al. Clinical phenotype in heterozygote and biallelic Bernard-Soulier syndrome--a case control study. Am J Hematol. 2015 Feb. 90 (2):149-55. [Medline]. Orsini S, Noris P, Bury L, et al. Bleeding risk of surgery and its prevention in patients with inherited platelet disorders. Haematologica. 2017 Jul. 102 (7):1192-203. [Medline]. [Full Text]. Bannow BS, Konkle BA. Inherited Bleeding Disorders in the Obstetric Patient. Transfus Med Rev. 2018 Jul 12. [Medline]. Peitsidis P, Datta T, Pafilis I, Otomewo O, Tuddenham EG, Kadir RA. Bernard Soulier syndrome in pregnancy: a systematic review. Haemophilia. 2010 Jul 1. 16(4):584-91. [Medline]. Pham A, Wang J. Bernard-Soulier syndrome: an inherited platelet disorder. Arch Pathol Lab Med. 2007 Dec. 131(12):1834-6. [Medline].